“Get your hair off your neck and it won’t cling to your skin. But don’t use just any elastic. Ribbon hair ties are much gentler to your hair and won’t create dents or crimps,” says celebrity stylist Philip B. To prevent hair breakage, switch up your style—topknot, low pony, high pony, braid—so you’re not stressing the same section of hair every time you work out. “Invisibobbles are the perfect workout hair accessory—because they’re made of plastic, they can hold hair without absorbing sweat and their spiral design makes it so they won’t cause headaches, hair breakage, or leave you with any weird ponytail holder mark,” notes Laurel Berg, stylist and owner of Laurel Beauty Lab in San Francicso. “I have a hairdo for every sport! The high bun is my preference for Pilates so no hair gets in my face, yet my head can lay flat without any obstructions from my hair. I go with a high ponytail with a headband at my hairline for high impact cardio. Braids are my favorite for skiing, as I like to keep my hair free of downhill wind that can cause tangles and knots. For cycling, I opt for braids as well because they fit nicely under a helmet!” says Susanna Romano, stylist and co-owner of Salon AKS in New York City. “Prior to your workout, lightly spritz a moisturizing leave-in conditioner on your hair . Then after your workout, hit up your head with a hair dryer, as most leave-in conditioners will reactivate with heat,” says Leah Sugru, a stylist at the Salon Mario Russo in Boston. “Apply a light leave-in or smoothing mist before rolling small 2-inch sections of hair into little balls all over your head and securing them with pins or elastics. 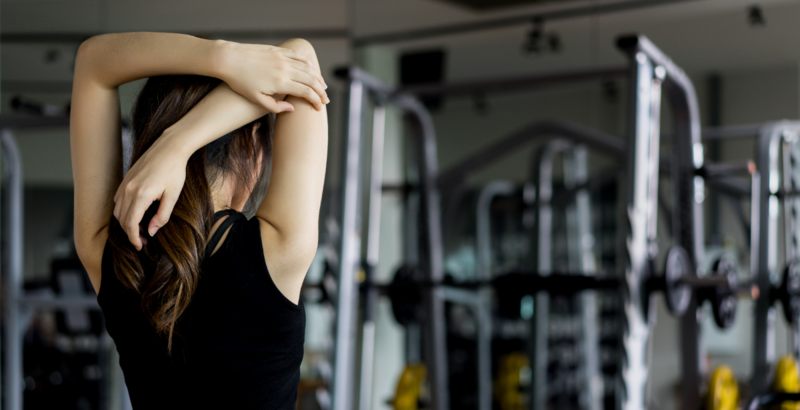 Once removed, you’ll have great texture after your workout,” says celebrity stylist Matt Fugate. “Buy a headband made from moisture-wicking fabric. Bondi Band, Nike, and Lululemon make good ones—they’re all stretchy, breathable, and designed to keep your head cool and dry,” says celebrity stylist Philip B. “I often tell women not to sacrifice their hair for a workout in a ponytail—all you really need are a few bobby pins to keep hair around the face from interfering with your workout. Bangs can especially benefit from being pulled to the side and clipped with a pin. I always keep one handy—I’ll slide it on my sleeve to make it easy to secure any loose hair pieces that come out during my workout,” says Susanna Romano, stylist co-owner of Salon AKS in New York City. “Avoid silicone-based hair products before exercising, which can attract dirt and sweat, making hair look dirty, fast. 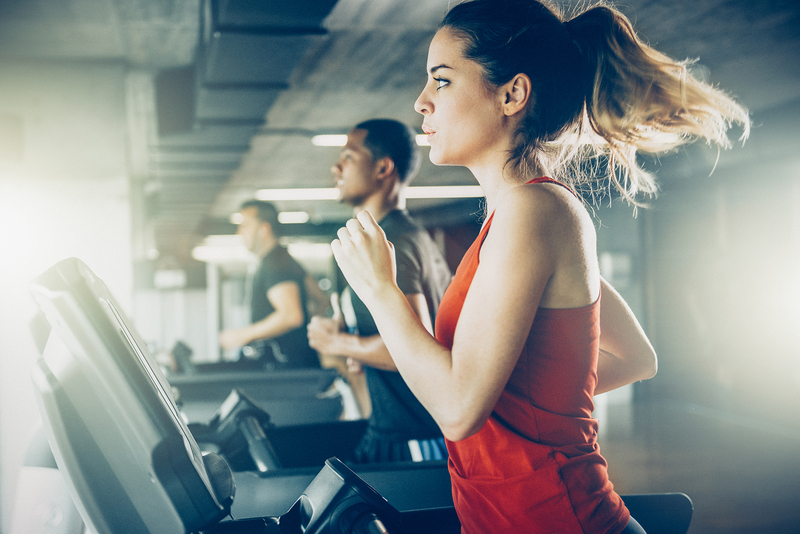 Plus, any product buildup will weigh hair down, leaving it flat after your workout,” says Chicago based stylist, Adam Bogucki, owner of Lumination Salon. “They may keep your hair out of your face, but a baseball hat creates heat on the scalp, resulting in added sweat,” says Dana Caschetta, stylist and national trainer for Eufora. “Touching your hair with your hands during a workout actually stimulates oil production in the scalp, so it’s best to keep your hair pulled up or clipped back so you’re not constantly fixing your hair,” says stylist Juan Carlos Maciques of the Rita Hazan Salon in New York City. “Hair looks and styles better when it's a little dirty, so post-gym, shower and wet your hair using a little conditioner throughout—but no shampoo. Once a week, use a clarifying shampoo to remove dirt, oil, and product buildup,” says Glamsquad's creative director, Giovanni Vaccaro. "These scents mask hair odors and hydrate strands,” says Mandee Hernandez, stylist. Look for ones that contain nourishing conditioners like keratin and silk oils, shine ingredients and static fighters. “Before you take your hair out of a ponytail or topknot, let your strands cool down. The cold setting on a hair dryer is an excellent way to achieve this goal. Simply run cool air over your hair and scalp for two to three minutes until you’ve removed any moisture and then release your hair,” says New York based celebrity stylist Paul Labrecque. “The sodium in sweat is Mother Nature’s sea salt spray. When you’re done exercising, take your hair down and tousle it so you’re spreading the moisture with your fingers for a great beach-wave look. In terms of keeping post-workout styling simple and fast, keep an emergency hair kit in your workout bag complete with elastic-free hair ties, bobby pins, a travel dryer, mini iron, and hair spray,” says stylist Andi Black, founder of CAJ Beauty. “Salt in your sweat can dry out your hair—especially if you’re working out under the sun’s ultraviolet rays—so it’s so important to keep your hair conditioned. I swear by hydrating oils spritzed on the hair before exercising outdoors,” says celebrity stylist Mara Roszak. A UV spray conditioner is also a good option. “If you’re rushed after a workout and don’t have time to wash and blow dry your hair, pull it up into a bun or top knot in the shower and simply cleanse the hairline (the nape of the neck, around the ears, and around the face), before drying these areas with a towel or hairdryer and letting your hair down,” says New York City stylist Katie Murphy, of the Marie-Lou&D Salon. “Prior to exercising, focus only on the roots when applying dry shampoo. Then after a workout, run your fingers through your hair and over your scalp to disperse the powder, which has now grabbed onto any moisture in the hair,” notes Juan Carlos Maciques of the Rita Hazan Salon in New York City. “You’re basically loosening the powder that was already there and allowing it to continue working.” If you don’t have dry shampoo handy, you can reach for some regular talc powder. Simply apply with your fingertips at the roots and the base of your neck after exercising,” notes Sharon Dorram, master solorist, Sharon Dorram Color at Sally Hershberger Salon. “Makeup blotting papers work to absorb and remove sweat from the hairline—they’re great if you’re on-the-go,” says Dana Caschetta, stylist and national trainer for Eufora. “Not all workouts have to leave you drenched in sweat. If you really want to get an extra day out of your blowout, skip the kickboxing, hot yoga, or Soul Cycle classes, and focus instead on effective, low-impact options that won’t leave you drenched in sweat. Mat Pilates, mellow yoga classes, resistance stretching, and Tai Chi are all great choices, as is water aerobics. Just don’t forget your shower cap!” says celebrity stylist Philip B. “While it might sound extreme, many women who suffer from hyperhidrosis (excessive sweating) have found relief with Botox. I treat women with serious sweat issues who struggle to keep their hair looking great post workout, and don’t want to put in the time, effort, and strain on their hair to wash, dry, and style it every day. Botox into the scalp can significantly minimize sweating in this area and allows you to keep your hair healthy by extending the intervals in between washes,” says New York City-based dermatologist Dendy Engelman. This article was written by Colleen Sullivan from Real Simple and was legally licensed through the NewsCred publisher network. It is not endorsed or sponsored by John Frieda. Please direct all licensing questions to legal@newscred.com.